Notes: The idea for the pattern design was developed by John Goddard and his friend, Clive Hendry, in London, England as a stillwater pattern. 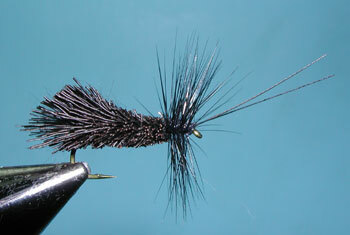 The idea was to spin hair such as Deer, Elk Belly, or Caribou and trim it into a caddis shape. The hair can be found in a number of colors and mixing the hairs would give the fly a mottled character. Conveying their thoughts of this fly to their friend, Andre Puyans, Andre developed the first prototype. 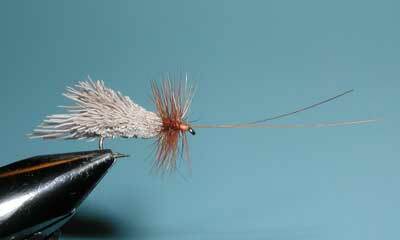 Originally, this fly was known as the G&H Sedge in Great Britain. It had a Deer Hair body with a rope of Olive Seal's Fur that extended under the Deer Hair. The hackle was also trimmed on the top. Andre made his own modifications to the pattern and promoted this fly as the Goddard Caddis and the name stuck. Since Andre also had a Fly Shop near San Jose, CA, the fly was introduced to Sierran flyfishermen and became a popular pattern. 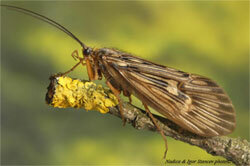 Due to it's high floatability, the Goddard Caddis can also be used in fast moving waters. In slower moving waters, the fly will create a very realistic wake when retrieved, skittering on the surface. This is very similar to what the actual Caddis insect does as it emerges at the surface and quickly tries to swim to the bank for safety. A telltale wake will ensue. Andre would sometimes use a marking pen to color the belly of the fly. The fly can also be used to represent hoppers and stoneflies, use floatant and fish near banks with foliage overhangs.